Uniformitarianism assumes that the same natural processes we see today operated at the same gradual rates in the past. James Hutton ( 1726 – 1797) discussed his uniformitarian philosophy, not just in terms of geological formations, but of the uniformity of time. This should not be surprising since the western concept of clock time is fundamental to how modern people think and measure. All modern earth histories begin with philosophy: a predisposition to look at the world a certain way, ask particular kinds of questions and answer with particular kinds of answers. Modern scientists are trained to think using a concept of time diametrically opposite to that of the biblical authors. To the ancients, time was merely an event marker, a way of counting celestial events. It had no actual existence in words, tensed grammars or in calendars. The ancients never imagined Earth history as linear. Solomon, wrote that long durations (olam – out of mind events) are in our minds (Ecclesiastes 3:11). The ancients used the cycles of the heavens as markers for days, seasons and years – as prescribed in Genesis One. The first Roman calendar had only 10 named lunar months. The last months were numbered in Latin: September (7), October (8), November (9) and December (10). Two ancient historians recorded that in the early roman society, some months had 20 days and some 35. Evidently, if the weather prevented you from seeing the new moon, that month would have more days than the next. The months of Januarius and Februarius were not named until the days of king Numa. Winter months originally had no named existence, since time had no meaning apart from events. Moses is quite emphatic about the non linearity of the heavenly cycles. God continues (imperfect verbs) to command lights in the plural heavens; He continues to form the Sun, Moon and stars to serve as markers for days and years; He continues make them into things that spread (Hebrew noun raqiya). Objects that continue to grow and orbits that continue to spread out cannot be linear. We confirm Moses’ creation account as billions of galaxies grew into growth spirals as the stars continue to accelerate outwards. Moses also recorded Jacob’s words to Pharaoh, that the days and years of the son are shorter and worse that the days and years of the fathers (Genesis 47:9). Ancient people looked back with longing on the patriarchal age, when their ancestors lived for eons. The Bible agrees, since it repeatedly calls the Old Testament era the eons. In the New Testament, 1 Corinthians 7:29 says our “time is short” – [kairos sustello – the preordained era that is contracted, drawn together, shortened, abridged]. A scientifically minded Christian, might question the idea that geological ages could pass in only 6,000 years. Job, who lived during the dinosaur age, claimed that man who is born of woman is of few days. Yet he listed geological markers for those few days (Job 14). Two of his markers are the sea (Hebrew west) dries and water wears away the rocks of the earth. The Jordan river, near Job’s town, cuts steep canyon walls through hundreds of meters of limestone. Even the wadis, that today only carry water during the winter, are sharply incised. To the south-west of Job’s home, the Nile river used to run through a narrow gorge, deeper than the grand canyon, cut through granite. 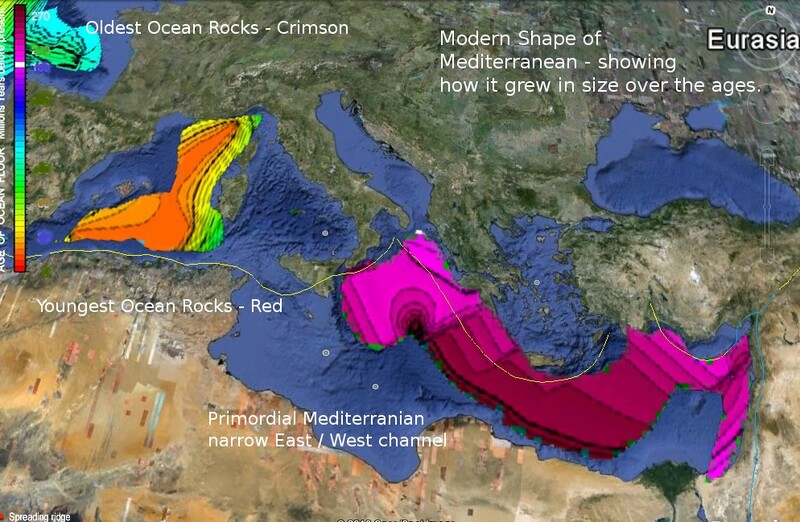 All around the Mediterranean, submarine canyons containing rounded pebbles extend down to the ancient sea floor that was thousands of meters lower than it is at present. Cores from the Mediterranean floor contain oceanic oozes, the rain of dead plankton that gradually build as microscopic creatures die and fall to the sea bed. Sandwiched between the oceanic oozes are thick layers of gypsum, stromatolites and rock salt. According to the ratio of radioactive daughter products in basalt crystals, the Eastern Mediterranean is the oldest ocean on our planet, existing before the Pacific or the Atlantic. In the above map, the Eastern Mediterranean is purple colored, the oldest, and the youngest seafloor is red. The drill cores from the Eastern Mediterranean also have the thickest layers of marine oozes and the thickest layers of salt-march products. This is a map of the relative age of the Mediterranean seafloor. At first, the only ocean was the eastern Mediterranean, before most of Africa split off from Europe. Notice how narrow it was before the western Mediterranean began to form. Job ended his poem about the brevity of life by claiming their faces changed (doubled) before they died. Indeed, we find the skulls of our ancestors with huge thick brows. The human skull grows slowly as we age. If we lived for geological ages, we would grow Neanderthal brows, but our grandchildren would have skulls more like ours, as the fossils show. This skull of an old Neanderthal man was found at Gibraltar. It is from wikipedia and AquilaGib under a CC 3.0 attribution license. Nearby was the skull of a Neanderthal child that had a modern looking face, yet with striations and wear on primary teeth as though it was extremely old, yet still a child. 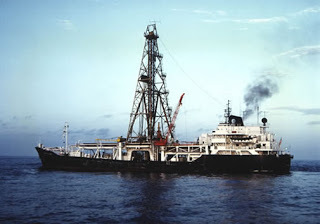 The top photo is of the drill ship Glomar Challenger that brought up drill cores from the Mediterranean in 1970. The photo is in the public domain as long as it is attributed to the Integrated Ocean Drilling Program. 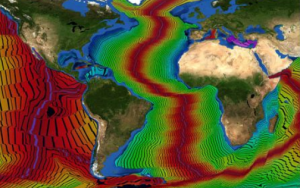 The maps of the seafloor relative ages are from NOAA.